How to make easy billing and invoicing software program in Excel? 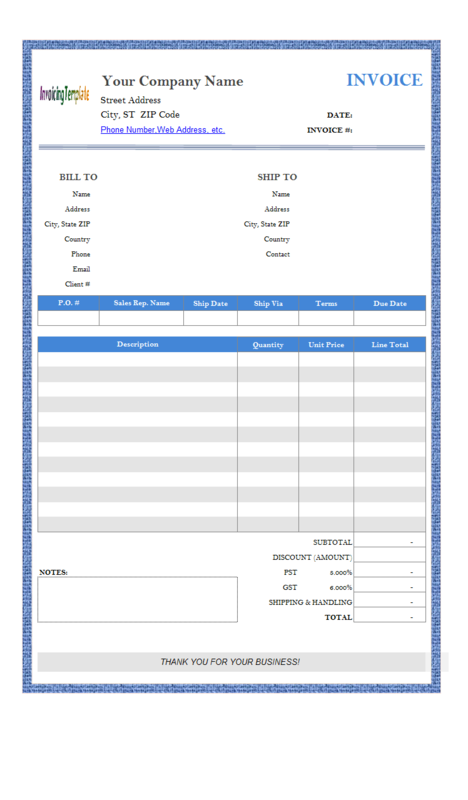 This is a hot topic as Excel provides vast features and tools that make it possible to create the invoice layout and bill form that not only meet your business requirements, but also professional, elegant, and even unique to your business. On the other hand, Microsoft Excel, as a front-end spreadsheet program, lacks tools and mechanisms for handling complex processing logic - for example, whenever an invoice is created, you have to create a unique invoicing number for it; you have to update the client account receivable; and you have to update product inventory if you are selling goods. There are many accounting / invoicing / billing software programs available. Most of them are complicated, expensive, yet they are not able to handle the invoicing form you like, or not straight forward enough for a home business, freelancer or small business owner like shops, service providers, manufacturers etc. Our idea is to combine the power of Microsoft Excel with a backend database system. 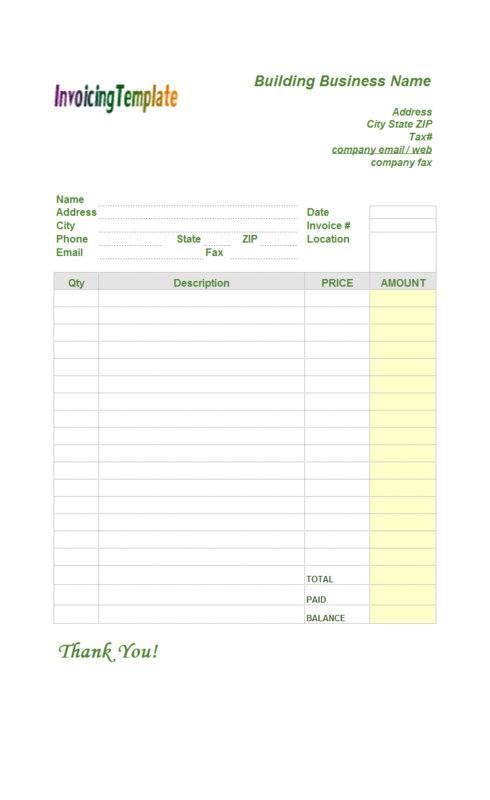 This invoicing and billing solution, Invoice Manager for Excel (namely Uniform Invoice Software), formerly named Excel Invoice Manager, provides the most flexible front-end that enables you to format the bill form in the way you like, including uses of Excel formulas and even VBA macros; it also maintains data integrity by using a database system (Microsoft Access or SQL Server). 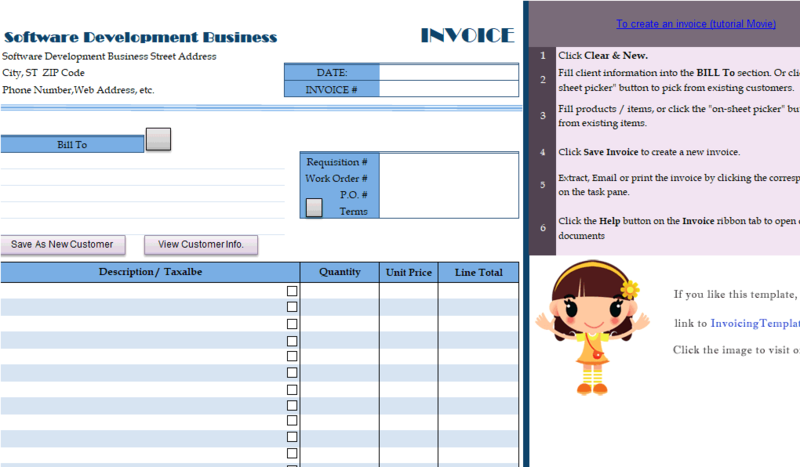 This design makes Invoice Manager for Excel (namely Uniform Invoice Software) a flexible and robust Excel-based invoice creator / generator. It supports all free invoice forms published here on InvoicingTemplate.com. Invoice Manager for Excel (namely Uniform Invoice Software) requires Windows XP / Windows Vista / Windows 7 / Windows 8 / Windows 10. Not designed for the United States businesses only, we have pre-customized forms and packages for other countries and regions too, like U.K., Malaysia, and Australia. 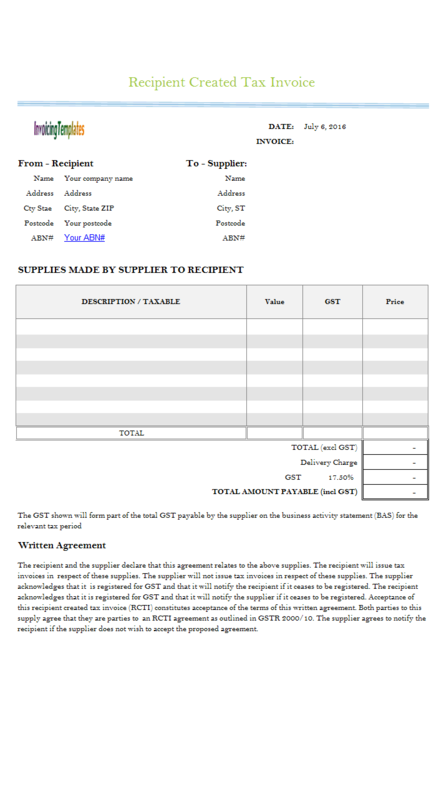 Visit tax invoice templates to find forms categorized by regions and the different requirements. 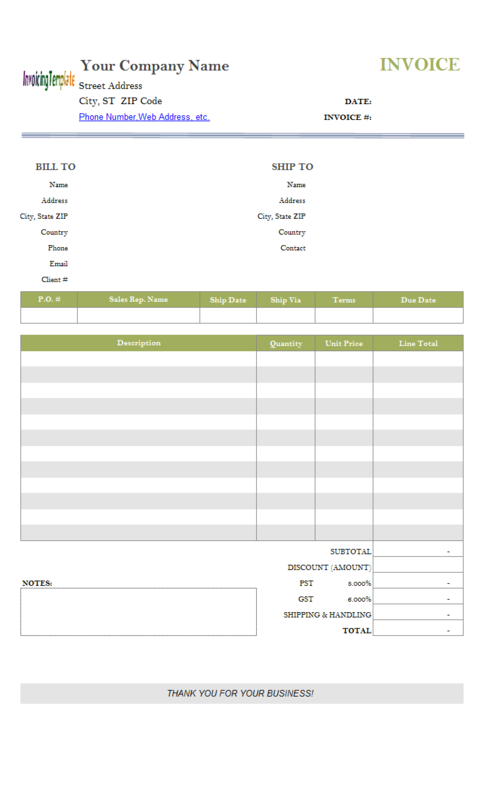 Billing Software Excel Free Download is a sub-topic of Billing Software Excel Free Download . Here are our templates closely related to Billing Software Excel Free Download. The template has 5 columns on the detail section. If you bill for hours worked, simply change the column headings from "QTY" and "Unit Price" to "Hours" and "Rate". 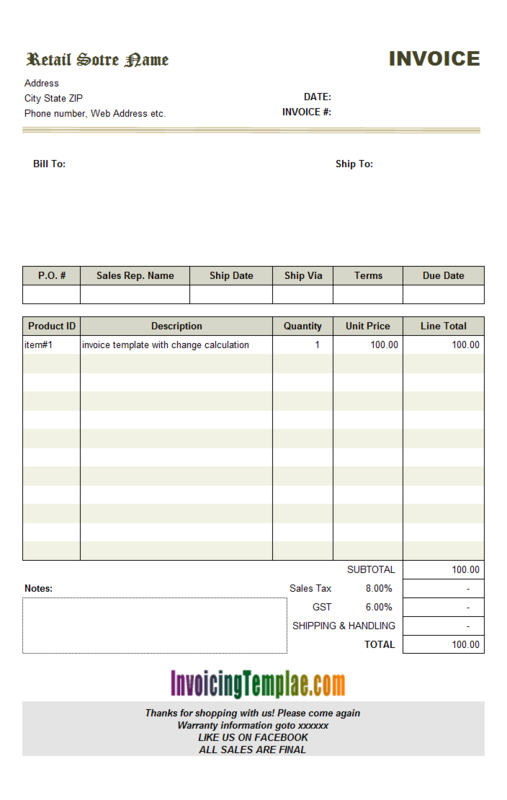 See invoice templates for hours worked for more samples. You may also like to visit our topic page at Excel billing software. 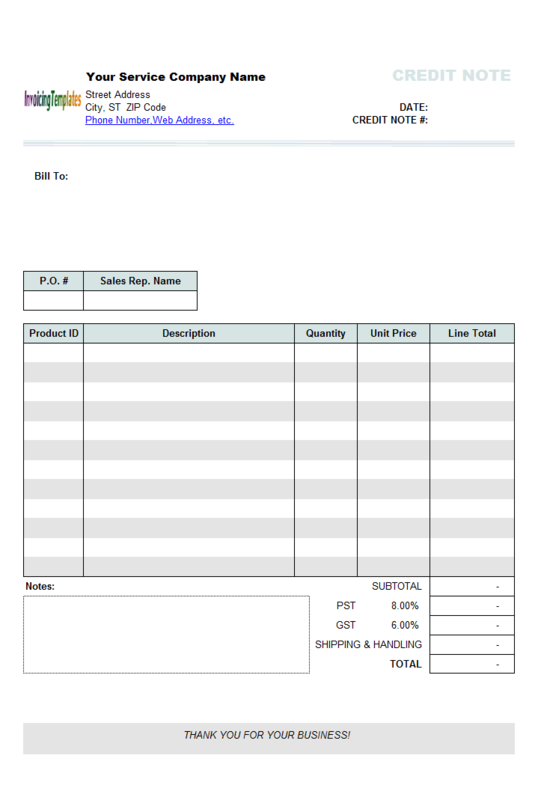 This sample consulting invoice template has only one column, consisting of 16 lines of the "Description" fields. 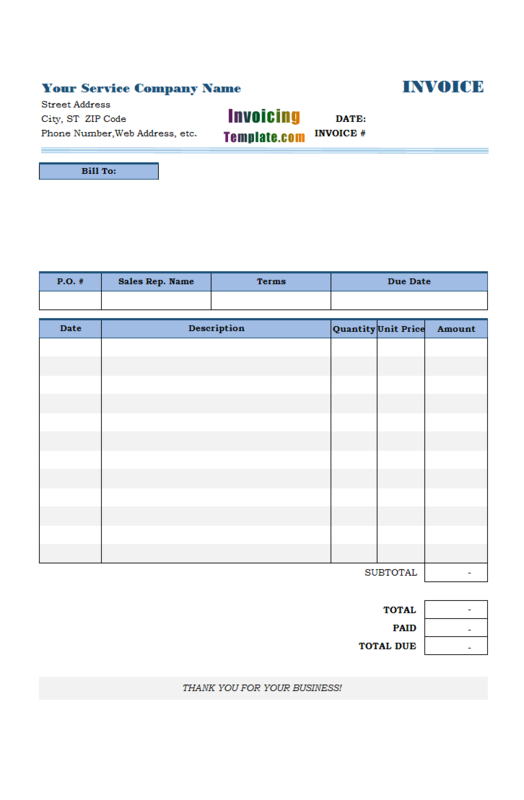 The total invoiced amount cell is manually editable. 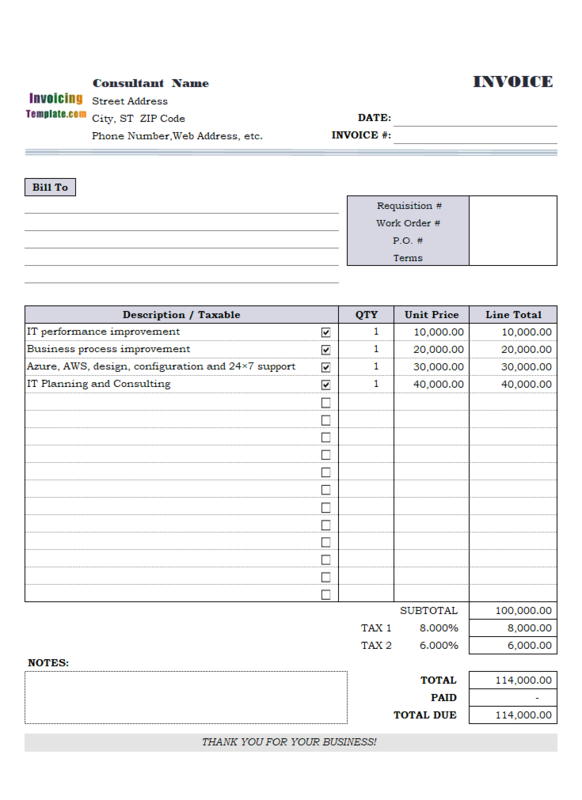 It also includes the "SpellNumber" VBA procedure to show the invoiced amount in English words. 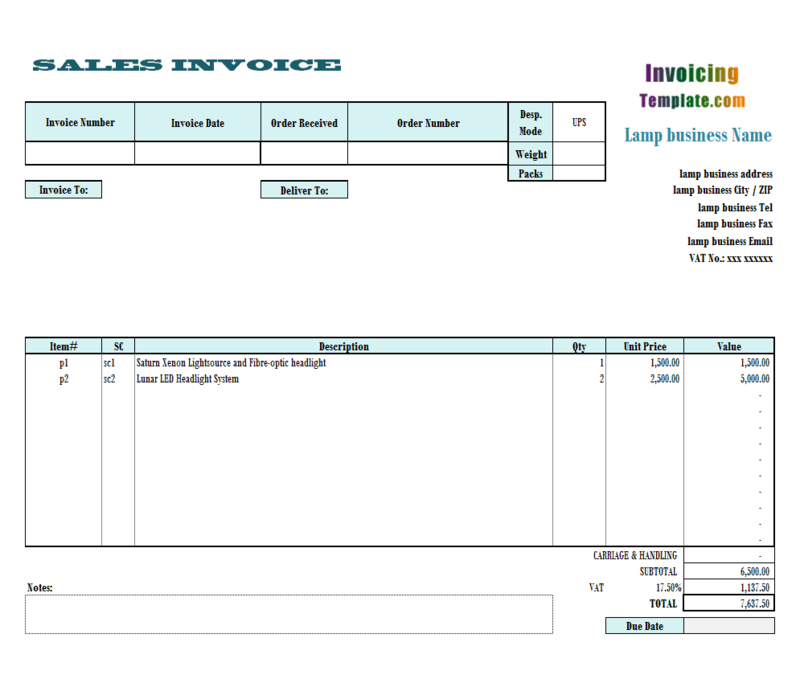 InvoicingTemplate.com, a web site running by Uniform Software Ltd, provides you with free invoice templates, and along with each free invoice template, a version that runs with Invoice Manager for Excel is also provided. Invoice Manager for Excel is our invoicing software that does the magic by turning a simple Excel invoice template into a powerful invoicing system. 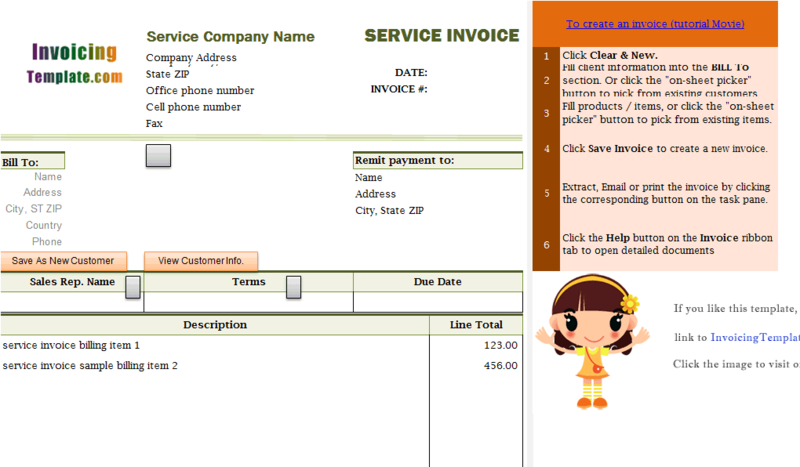 All the invoice templates available here on InvoicingTemplate.com are samples of customizing the default invoice template shipped with Uniform Invoice Manager. Your business is unique, so your invoice should be. 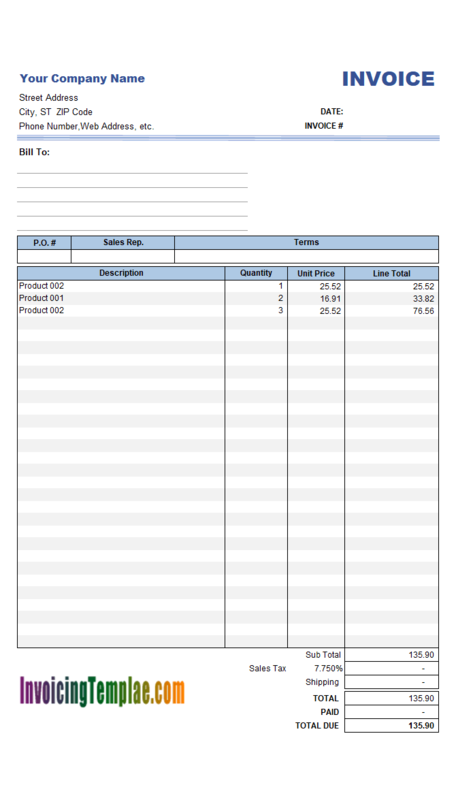 Browse our growing invoicing template gallery to find out how it could be by using Excel to customize the default invoice template. 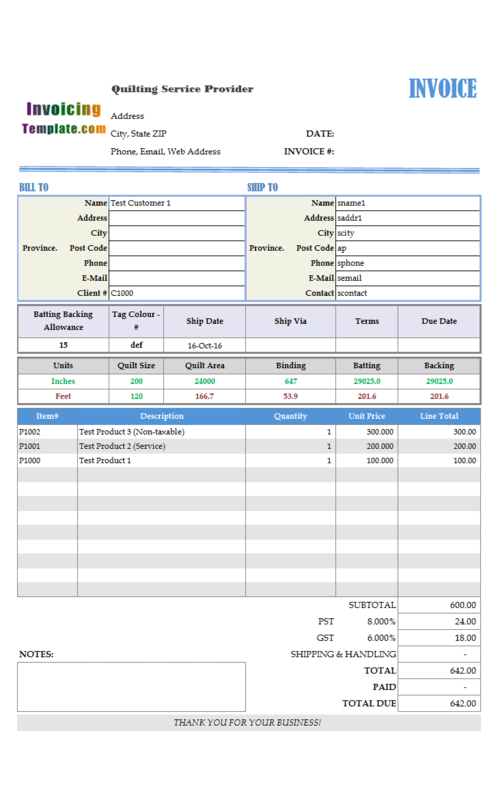 While the features implemented by this serial of invoice template don't benefit the users of free invoice templates a lot, we do provide the fully functional trial version of Invoice Manager for Excel. So don't forget to download and try it to see if it meets your requirements. 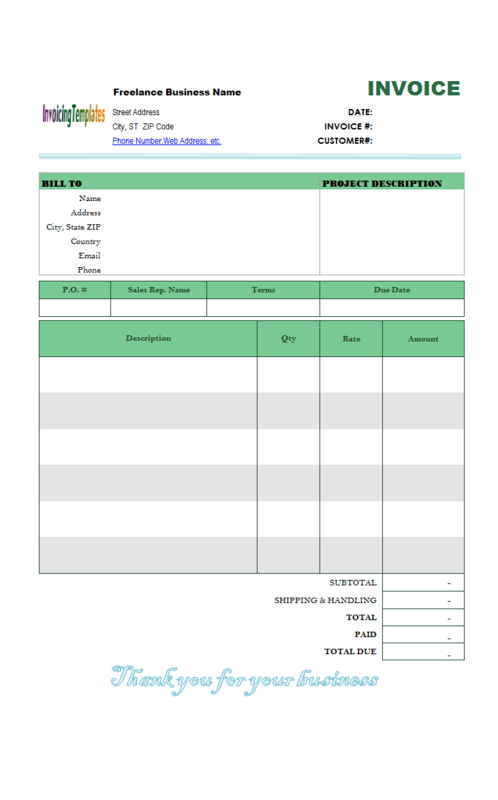 Designed for computer programming freelancers, development teams and small businesses, this software development invoice template in Excel spreadsheet format helps you create invoices and bills that are not only professional, but also cool. 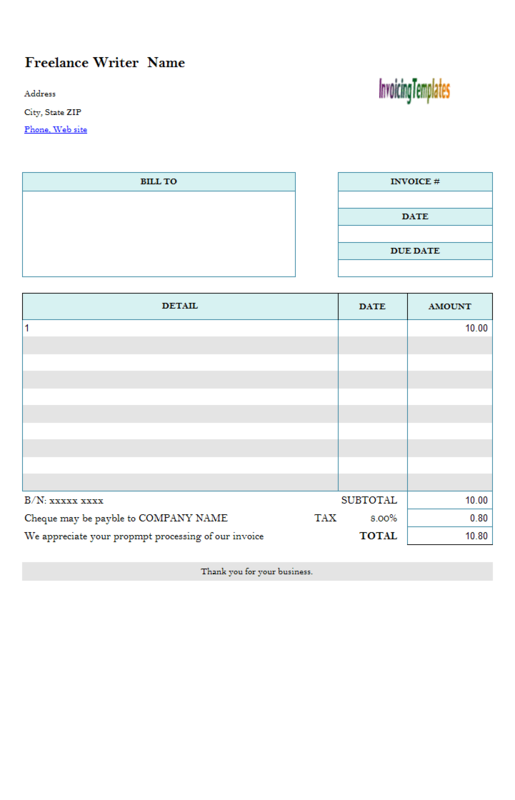 We've already published an invoice format for freelancers, at Freelance Invoice Template; and for a list of invoicing forms that could be used by freelancers like designers, developers etc., visit Freelance Invoice Template For Service Business, Graphic Design Freelance Invoice Template, Freelance Web Design Invoice Template, etc. 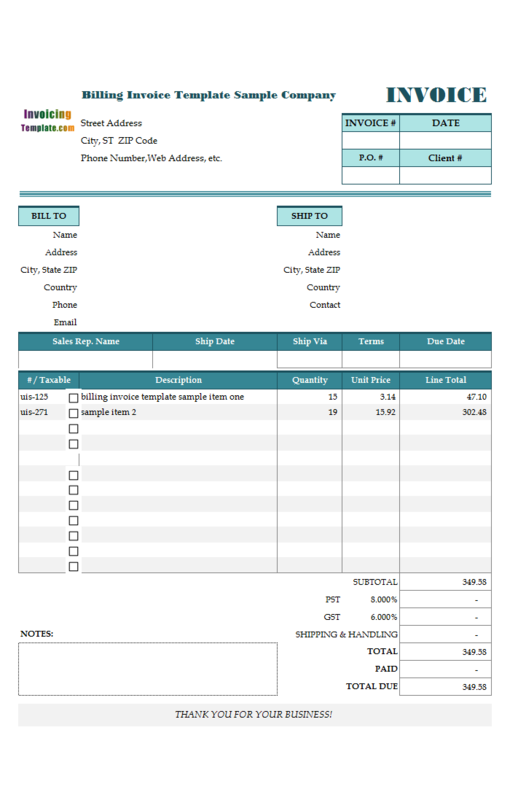 Unlike Freelance Invoice Template, where the calculation of line totals are done by multiply "Hours * Hourly Rate", in this billing template sample Freelance Writer Invoice Template, the amount of each line is manually fillable - this means that it is more suitable for project or contract - based billing. You can find more invoice samples for hourly-rate based invoicing under the Service Invoice Template and Consulting Invoice Template. 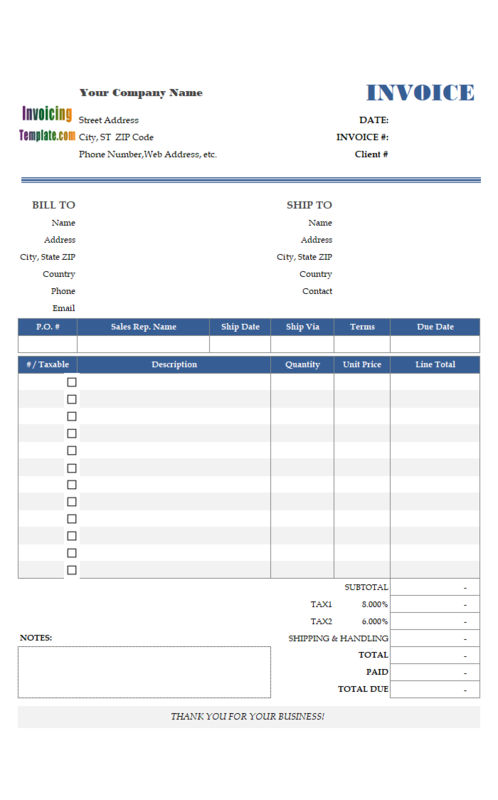 You may find many invoicing templates available here on InvoicingTemplate.com meet the above criterion, including Freelance Invoice Template, Invoice Template Hourly Rate, or visit our service invoice template category. Every business is different. 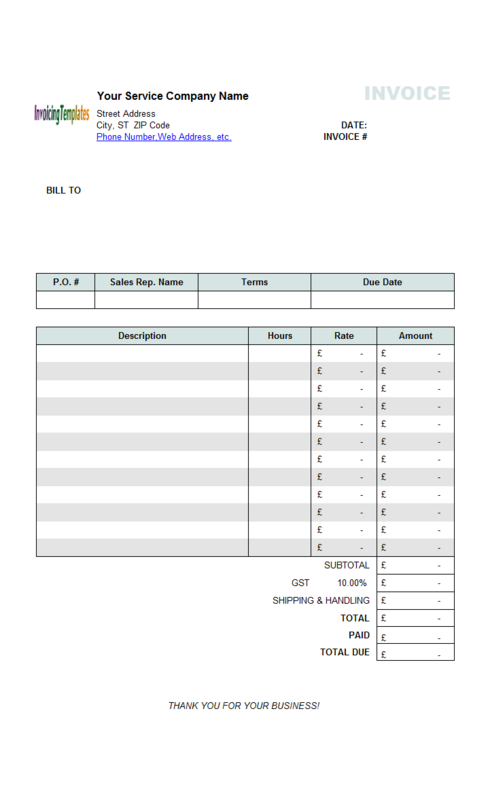 You may like your invoices not only including all the required information, but also looks professional and special to your business. 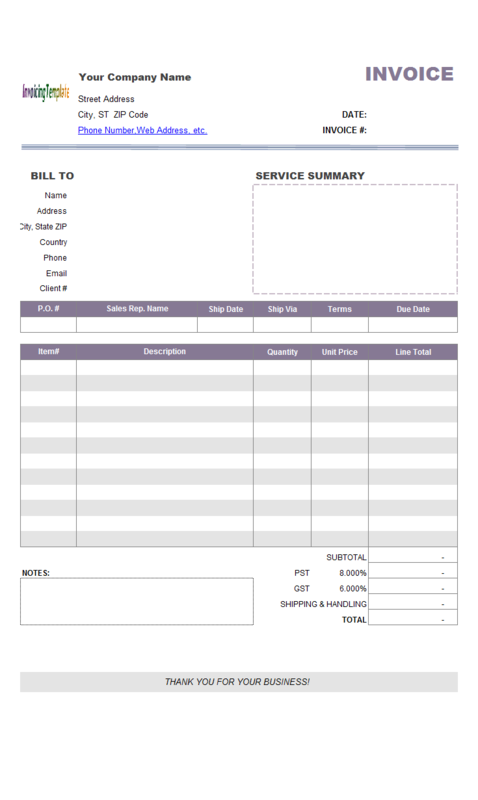 That is why we at InvoicingTemplate.com create this new freelance invoice template and offer you for free, Professional Freelance Bill / Professional Freelance Billing Format. 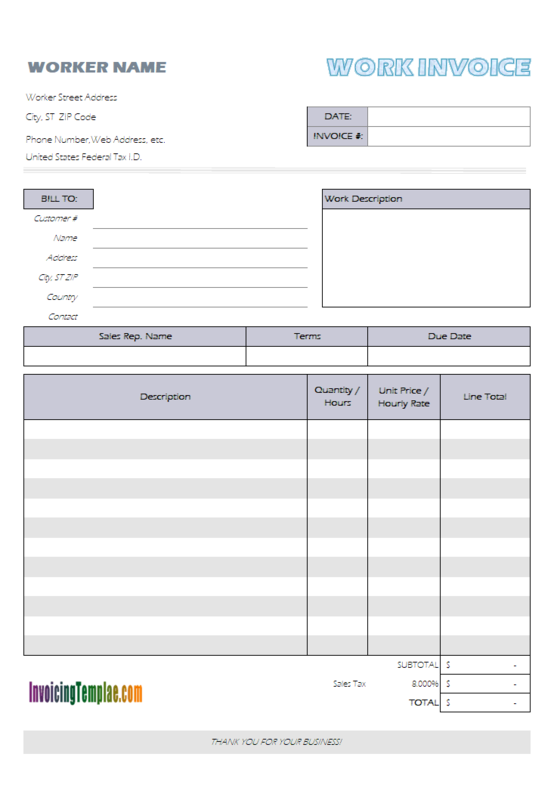 This sample template also adds the line of "United States Federal Tax I.D." to the bottom of worker information. We also formatted several fields to show the US Dollar currency symbol, such as "Subtotal", "Tax" and "Total". This labor billing format for Excel is in Microsoft Excel spreadsheet "xlsx" format. 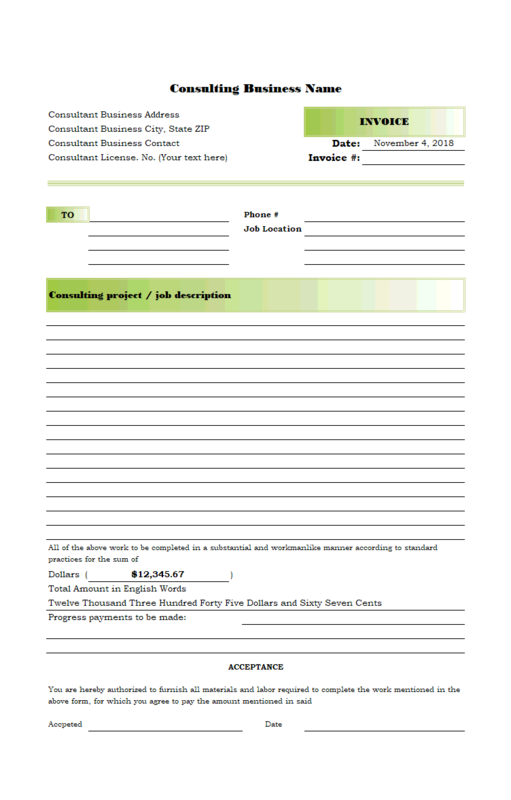 A PDF format is also generated using Excel, including the document for this template. If you have Invoice Manager for Excel (namely Uniform Invoice Software) installed, the invoicing software app is able to create PDF invoice automatically and send to your clients with simple mouse clicks. 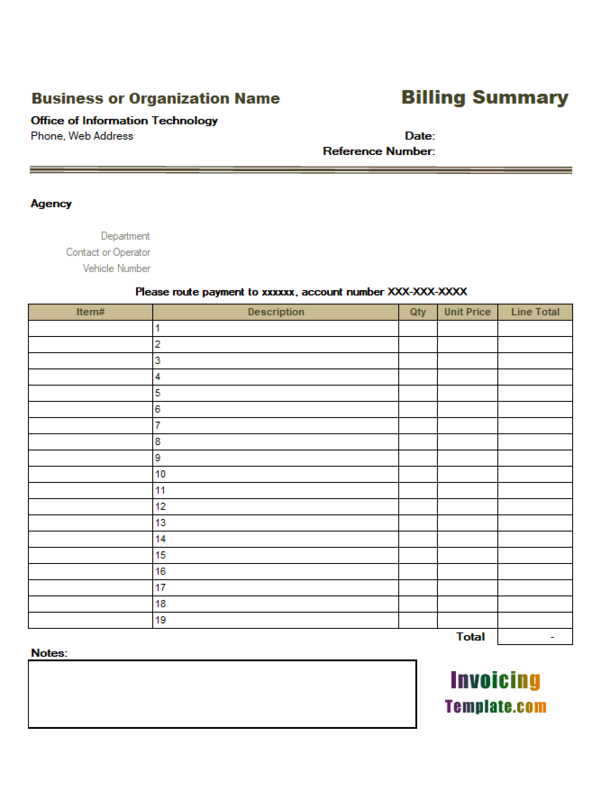 This billing summary in Excel spreadsheet format was originally designed for an office of information technology that provides radio communication services. The downloadable package includes two formats, one-page template and two-page template. For example, you can have the program generate invoice#, customer# automatically; you can easily retrieved all information about a saved client by entering its customer#, or looking up using the data list window. Sending invoices to clients in PDF, image (PNG) or Excel format using email is also just one click away, see How to email invoice to customers for more information. This template introduces 2 custom fields that are added to the invoice header database table - "Case #" and "Case Reference". Third, it is also required to clearly describe the donation, including the date the donation was made, as well as the amount of the donation. 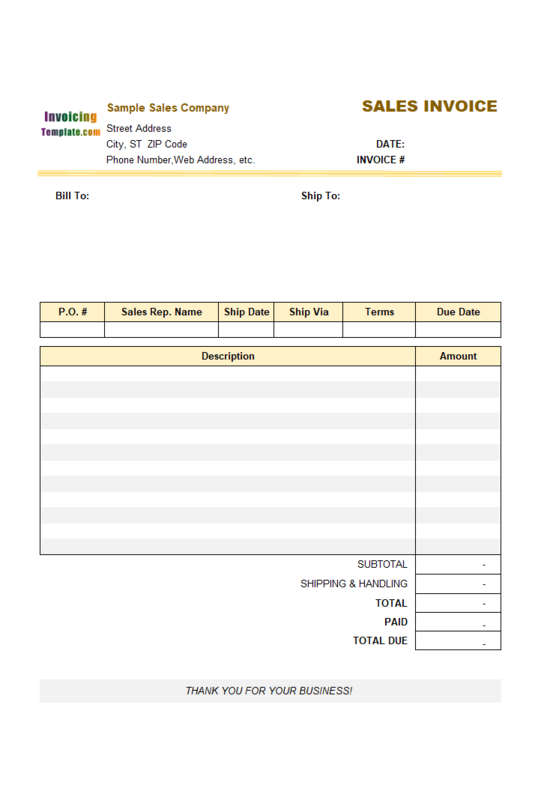 By using Excel invoicing forms, it is possible to leverage all the powerful tools provided by Microsoft Excel to do design of invoicing forms, including create relationship between Excel cells by using formulas - for example, in c4051 Simple Invoice Template - Discount Amount Field a new field Discount Amount was added and its relationship between Subtotal and taxes are established by using Excel formulas. Starting from Invoice Manager for Excel (namely Uniform Invoice Software) version 5, we removed the support for on-sheet ActiveX buttons and added support for shape buttons. The following table shows all the button names, captions and default hotkeys assigned to each button. 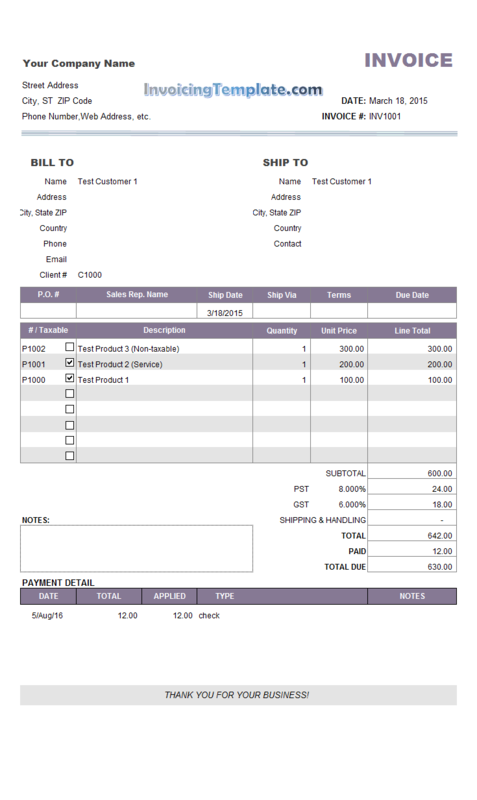 The result template of this customization can be downloaded for free here on InvoicingTemplate.com. 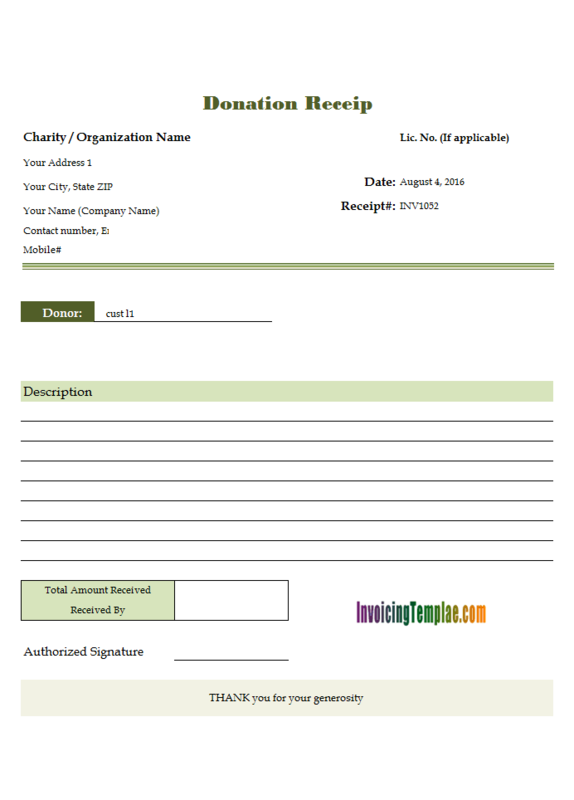 If you are interesting in the implementation details on how to create this customized service credit note template, read on. So you want your invoices stand out from the generic, like your business? It is actually easy with Excel and Invoice Manager for Excel (namely Uniform Invoice Software). 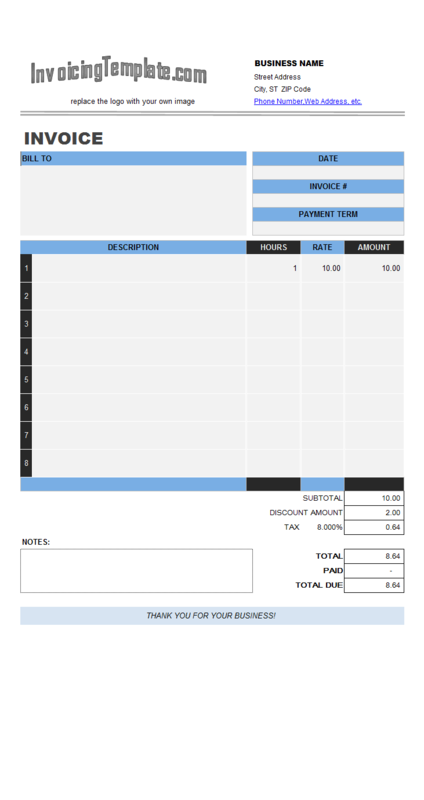 With this sample we create a free simple invoice template that uses shapes.